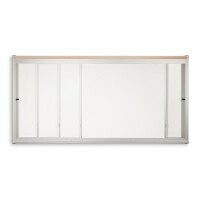 Horizontal Sliding Whiteboard Units pack plenty of writing surface area into limited wall space for an efficient communication solution in your office or classroom. In addition, the sliding design preserves the flow of presentations by enabling teachers and lecturers to keep writing on multiple surfaces without constantly stopping to erase. 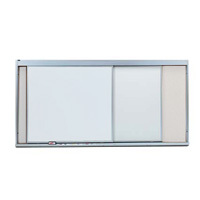 Install a Horizontal Sliding Markerboard System and make the most of every square inch in your indoor work area.